nevard_120224_grain_IMG_2695, a photo by nevardmedia on Flickr. 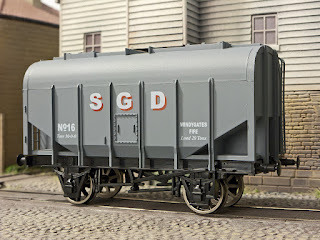 We all start projects and then lose interest or simply get side-tracked with other projects; and some of you may remember back to September one of my many projects was to upgrade the Dapol 20 ton grain wagon? A good thing about running a blog is that it forces one ever so often to look back at ongoing or stagnant projects because somebody will always remind or ask you how it's going - there is no escape, which is probably a good thing! This elderly ready-to-run offering dates back to Horny Dublo days, probably when the real railways still relied on steam for day to day power. It was later res erected by Wrenn and later Dapol who I believe still have this in their current catalogue, do correct me if I'm wrong though! Out of the box, it's a nice moulding. At a first glance it does look like what it's supposed to, a grain wagon with the distinctive hopper design and vertical strapping along the sides. This spontaneous purchase was the need for some grain wagons for Brewhouse Quay. 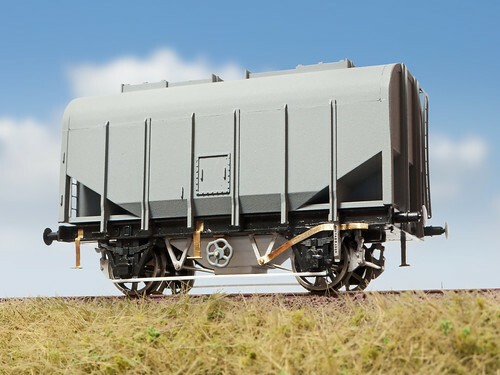 I thought all I'd need to do would be repaint and weather the wagon, then after looking at Paul Bartlett's excellent wagon site found out just how wrong the model is, well below the waist anyway! People who know me, know that I don't get too worried if things aren't quite right, my ethos being more about atmosphere and capturing the character of a working railway. However it's good not to be too predictable, so thought I'd have a play to see if I can improve on the model little, and anyway a job like this makes a change from snapping layouts or wielding a Grasmastmer! As already mentioned, lifting the skirt reveals the greatest area where improvements could be made, so back in autumn at Scaleforum I picked up some white metal brake gear castings. I won't go into too much detail because filing and cutting up bits of metal is hardly exciting, but the job mainly involved chopping off the Dapol brake gear and fitting on some of the bits. I didn't have a long enough brake handle, so offcuts of grass (brass) were used to fabricate new ones along with some steps. The new base of the hopper was carved up from some laminated 3mm plastic card, 4 layers in total to get the depth more of less right. The circular 'tap' handle or whatever it's called is from an industrial piping kit and not quite right, but can easily be replaced at a later stage with something better. 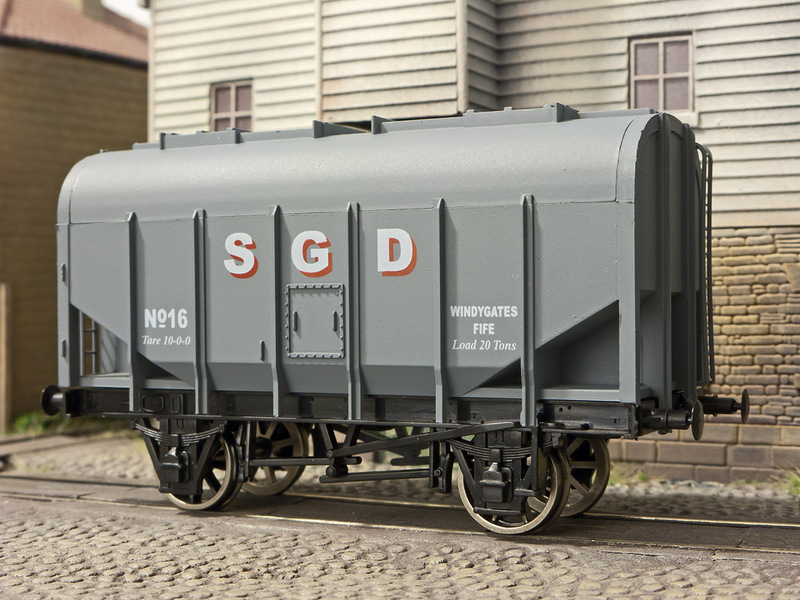 The wagon is 4mm too short, but to graft in extra length would make this project to one stage beyond sanity, and after all I only bought this as a quickie! Next will be to number and weather it up, they got into quite a state as Paul Bartlett's photos demonstrate, that bit I'll enjoy the most. I'll try to do this over the weekend. Beware the Low Emisson Zone! 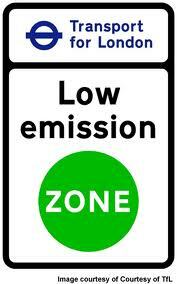 Something we need to be aware of should we have to use a van, minibus, lorry or large older vehicle to take our layouts to shows within the Greater London Low Emission Zone. This letter came via the Model Rail editorial office (name and address supplied, but removed for this post). 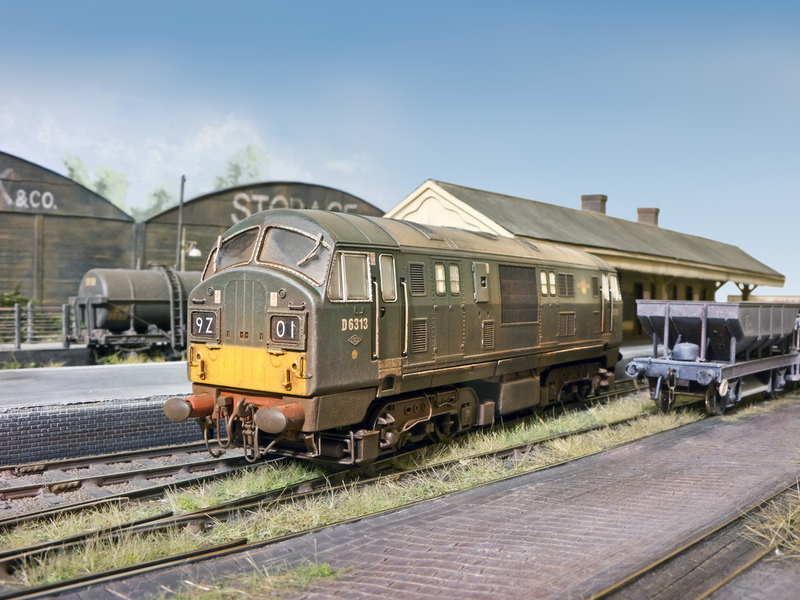 'Our club was invited to attend the recent Erith Model Railway Exhibition in January. It was an excellent exhibition and we enjoyed ourselves displaying and operating our 00 layout. However, on our return we received a warning letter from Transport For London informing us that the van we had used to transport the layout was no longer compliant with the Greater London Low Emission Zone (LEZ), and that next time it entered the LEZ we would have to pay £50 per day or face a £1000 fine. Converting the vehicle, a 10+ year old VW Transporter, could cost up to £1500, a price the owner is not prepared to pay for occasional London use. The warning therefore to all attendees at London exhibitions is make sure your transport is LEZ compliant beforehand, or alternatively factor in the £50 per day in your expenses. If you have to cross London to get to the venue, stick to the M25. To Greater London exhibition managers, please indicate whether or not your venue is inside the LEZ when you invite organisations to your show, and whether or not you regard the £50 per day as a legitimate expense. To find out if the above could effect you, follow this link. nevard_120211_combwich_IMG_2594, a photo by nevardmedia on Flickr. Anyone who takes their trainset out on the road will no doubt get these solitary types that hang around their pride and joy peering over their glasses just a little longer than most. They're easily spotted because they'll tend to dwell on one particular area longer than anyone else, concentrating on something or other which isn't immediately obvious. After 10 minutes or so they'll try to capture your attention, you of course know this and will almost by instinct pretend they're not there by conveniently finding a member of the audience to chat to, or simply disappear off to the fiddle yard murmering something about swapping some trains around. Like flies to a smelly horse, they don't normally give up and will almost certainly fail to notice the layout owner's body language which says 'go away', 'bog off', or maybe something far too colourful to type here. When they do finally strike like an oversized hungry mosquito on a mission, this will always be when you briefly let the guard down as you nip around the front of the layout to re-attach the drape or deal with a tricky 3 link coupling. Damn and blast! These are of course the nit-pickers, they're those who have probably never built anything, but purely go to shows to find to their eyes what are errors and failings, then take a great delight in correcting the builder. When they're not at shows they'll be hanging around on internet forums giving 'helpful advice' when they could be doing something more useful like hoovering the carpet or sorting out 'mother's meals on wheels' or counting the sprocket holes on a roll of 35mm film. My most recent one was at the Guildford show, this one was standard-issue complete with gabardine raincoat and one of those shopping bag/basket things with wheels and a handle, you know the model, the one with go-slower tartan pattern to go with the matching thermos. 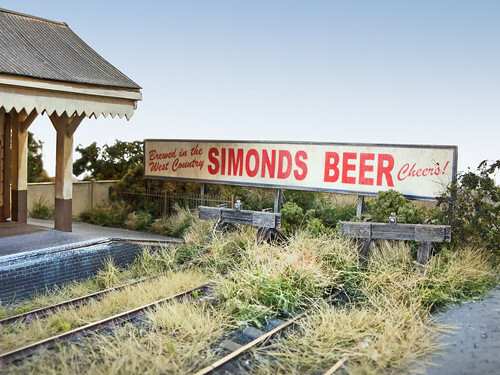 The subject of his observation was the Simonds Beer hoarding on Combwich, and off he went with the usual nasal diatribe; "Young man, do you know where Simonds Brewery was? It wasn't in the West Country but Reading! This is completely wrong!" Flies and mosquitoes can be swatted, but slapping a member of the public is likely to involve a night down the local nick, so one has to retaliate verbally with a well rehearsed explanation; "it's based on such an advert that greeted motorists on the A38 as they drove through Bridgwater and underneath the Edington Junction to Bridgwater branch of the old SDJR in the early 1950's". This is of course quite true and for those that have Mac Hawkins' 'Somerset & Dorset Then and Now' book, have a look at page 212 there is the proof. The nit-picker was wrong for a change and hence the reason for this post. Simonds Brewery, whilst indeed it was in Reading, the period advert proclaimed 'Brewed in the West Country', which with today's heavy advertising regulation would be hard to justify, but I presume in 1950's Britain, things were a little more relaxed, and of course Reading is west of Heathrow which might have been enough for the brewery to get away with such a claim! So, all you know-alls out there, not everything in this world makes complete sense, you're not an authority on everything, and not everything must be taken too literally. But most importantly, there can be a prototype for almost anything if you look hard enough - which is great for us who actually do some model making. Of course Daily Mail readers/Jeremy Whine viewers will say that I should have an information board on the layout explaining this, but it's far more fun to catch the nit-pickers out this way to their face, even if just to treasure albeit too briefly the disappointment on their faces as they wander off to irritate somebody else. Since the last show, and whilst the layout has been set up at home I've been pondering on extending Combwich by around 4 feet. The idea is to extend the little 15 inch board which has the level crossing, pub and crossing keeper's cottage on to around 4 feet. The little board was originally built to allow Combwich to become a long wall hugging layout from its original 'L' shape to suit the then domestic environment of 10 years ago after the layout was res-erected from 15 years storage. Currently the fiddle yard is where the new scenic extension will be. The current angled entrance to the fiddle yard has never been ideal, this will allow access to the new fiddle yard at a better angle. 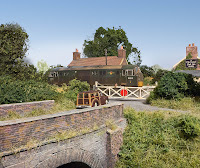 I want to replace the fiddle yard with a 360 degree rotating one as with Catcott - but somewhat longer to accommodate 4 coach trains with a loco. This will speed up operation and reduce loco handling. 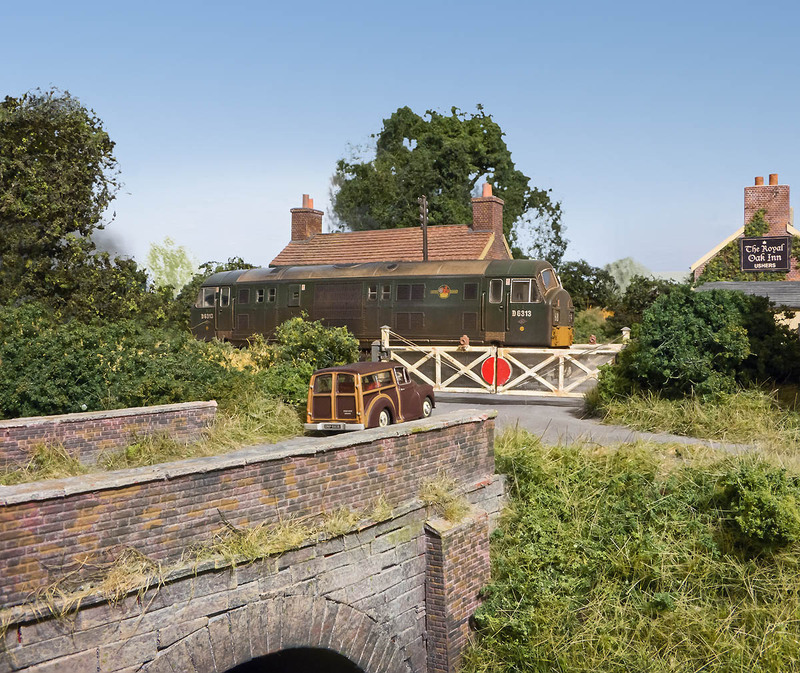 The existing scenics will be kept, but the backscene will be removed which is currently to the left of the crossing keeper's cottage. Thoughts for the next section are a dairy, this would be typical of such an area and maybe a works halt a little like Polbrock, but more SR in style with a concrete edged platform. Extending the current Rhyne to run along the front could give it a Bason Bridge feel with the dairy and railway next to the river Brue. 'Exit left' will be under a bridge - and will utilize the other half of the portal used for Polbrock. BR (Rail) Blue. Photo: Richard Lewis, posted here with permission. ﻿Compared to the present day, Britain's railways were a mucky place 45 years ago, the rest of country wasn't much different then either. Whilst it's easy to mock the grotty 1960's developments, it's easy to see why people were keen to get rid of a scruffy run down past and replace it with a shiny looking space-age landscape. The state of D6333 in this shot rather reflects the state of grottyness which was frequently the norm. It's not easy to imagine that when the photo was taken the loco was well under 10 years old. At the time, it wiould be comparable in age to a Freightliner Class 66 now. Scary. around its train on the author's Combwich layout. When I started to weather mine the other day, there was some quite valid suggestion that maybe I went too far, but after looking at a few examples in Richard Lewis' wonderful archive since, I'm beginning to think that mine isn't tatty enough. However my scenario depicts the railway as it was a few years prior, so I may well tidy mine up a little and work a little of the grime off around the cabsides to give a used sheen and to reduce the overly dusty look. Looking at Richard's photo, flaking paint appears to be a feature of the time and probably the result of cellulose paint being rubbed off with a carriage washing plant. Modern paints are alot better in this respect and anyone who remembers polishing a cellulose finished car will know just how much paint used to end up on the polishing cloth! It's quite trendy these days to create marks on the windscreen showing where the wipers have kept the glass clean. I had a go using a little cloth to selectively remove the weathering pigment, but after further looking at Class 22 prototype photos, this feature is rarely ever seen, and whilst the engines were often in a right old state, the glazing was generally spotless and probably wiped clean daily. I would appear that I have fallen into the easy trap of modelling a model!